Almost all of my work is set in Nebraska, in the small towns and urban communities I’ve lived in or been to. I’m intrigued by the way geography and local history form the spirit of small communities—whether urban or rural—specifically from the lingering effect of historical trauma. So it’s become important to know local history, to recognize how different people identify themselves and others, and why this is so. Writing is mostly conjecture and projection, but, with my experience of living here my whole life, hopefully my work is an informed version of conjecture and projection. 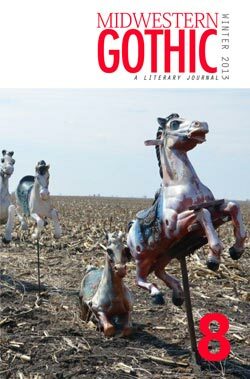 And if you haven’t yet secured your copy of Midwestern Gothic 8, featuring my short story “The Mercy Killing of Harry Kleinhardt”, you should do so in either print or digital format, whatever’s your yen. Thanks so much to Jeff and Robert for publishing this story, and now for featuring me in their blog spotlight as well.